Two years ago Lite Guv Dan Patrick (a constitutionally mandated office in Texas) was tearing around the Great State of Texas accusing schools district (independent governmental agencies in Texas) of all manner of immorality and transgression for trying to accommodate transgendered students with bathrooms they could use, too. He fought that fight viciously in the Lege, losing it because a more sensible Speaker of the House wouldn't bring it up (Lite Guv presides in the Texas Senate). * Then came the thrashing of Texas Republicans last November, some of whom lost, many of whom barely won what should have been walking away victories. At a Governor’s Mansion press conference on the second day of this year’s legislative session, Lt. Gov. 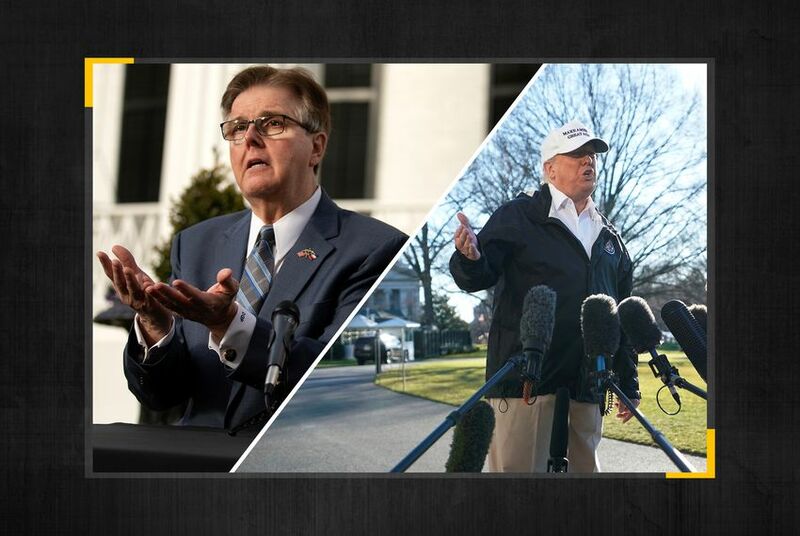 Dan Patrick — who last session was the top state leader championing the measure, which would have regulated the use of certain public facilities for transgender Texans — suggested there’s no need to bring back the divisive proposal that headlined the last legislative year in 2017, but failed to reach the governor's desk. “There aren’t any school districts forcing students — as one school district was — to share showers, lockers and bathrooms,” Patrick said. But experts said most school districts work to accommodate transgender students on a personalized basis, and that that approach has not changed in light of the debate at the Capitol in 2017. “I don’t want the next national emergency to be that some Democrat President says we have to build transgender bathrooms in every elementary school in America,” [Rep. Matt] Gaetz [R-FL] said. **Apparently Patrick offered for Texas to build the wall, in Texas at least, providing the Feds reimbursed the cost. Not only would such costs include construction and materials but, of course, eminent domain claims the state would have to pursue, hardly a politically popular circumstance in this state in the best of times. And then there's the matter of the Congress holding the pursestrings, not the Administration. If you haven't noticed, Trump's clout with the House, where all funding approval must start, is not the greatest just now. Trump did tell the press it would be a "relatively small amount of money," which shows Trump has no clue, either. Yeah, nobody ever accused Dan of being the sharpest blade in the drawer.